Twenty-five years ago today was the first — and last — Chicago Hockey Show. This two-day, noting-but-hockey event was truly ahead of its time, almost two decades before the Chicago Blackhawks started holding their own annual summertime convention. Held on August 25 and 26, 1990, the Chicago Hockey Show gave fans an opportunity to meet and get autographs from current and former ‘Hawks players. 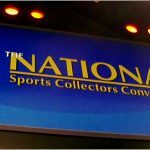 There was a dealer room that was focused almost exclusively on hockey memorabilia, from game-used jerseys to hockey cards. And speaking of hockey cards, Pro Set was on-hand, giving out samples from their forthcoming 1990-91 hockey set several weeks before you could buy the cards. As a young hockey fan in 1990, the Chicago Hockey Show was almost too good to be true. 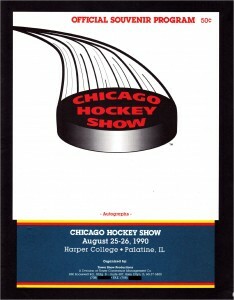 The 1990 Chicago Hockey Show program. The cover says 50 cents, but I’m pretty sure they gave these to you for free, as I ended up with about a dozen of them. It was only by chance that I found out about it. In early August of 1990, my aunt, grandmother, sister and I went to Wisconsin for a vacation. I made a list of card shops in the area we stayed in, hoping to find hockey cards during our trip. At one of the shops we visited, the store owner saw my Blackhawks t-shirt and asked me if I was excited about the upcoming Chicago Hockey Show. 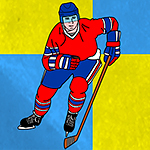 “What hockey show?” my aunt and I replied in unison, drawing forward to hear more. The dealer showed us an ad for the show in the latest issue of Baseball Card News, which I promptly bought. I was stoked; a show dedicated just to hockey! No looking at endless tables of baseball cards, hoping to maybe find a few hockey cards in the mix. When we got back to Chicago, my aunt purchased tickets. For $8 per day, you’d get into the show and get all the autographs you cared to wait in line for. That’s a steal compared to the many fan conventions today that charge upwards of $100 admission. Looking at the program (full PDF of it here), I am reminded of some of the activities that I did not participate in, such as a slap shot cage, which would measure your shot speed with a radar gun. Seeing as how I had no upper-body strength as a kid, spending $1 to shoot a puck three times — something I could do elsewhere for free — didn’t exactly call out to me. There were also several hockey clinics, but since there was no ice, these were lectures more than actual clinics. For some reason, Blackhawks color commentator Dale Tallon hosted the clinic on goaltending, which made no sense since he was a former defenseman. Plus, recently-retired ‘Hawks goalie Darren Pang was at the show. Surely, Panger, who was named to the NHL’s All-Rookie Team in 1988, would have been a better choice. 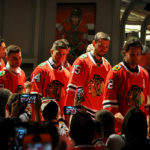 One regret I have was not getting my picture taken with a Blackhawks player, which cost $6 for an 8″ x 10″ color print. Keep in mind, this was during the film photography days, where the photo had to be developed, printed and mailed to you. (Think about that next time you tweet a selfie.) So, $6 wasn’t really a bad price. I could have had my picture taken with Chris Chelios, Steve Larmer or Doug Wilson, among others. Of course, $6 was a lot of money in 1990 for me to buy a picture that I wouldn’t even get for three weeks! Plus, there was a room full of hockey memorabilia, so I had to stretch every dollar. I’m sure I bought some cards, but I can’t recall any awesome purchases I might have made then. What really stood out to me was all the free Pro Set cards that I got. Pro Set, who was a sponsor of the 1990 Chicago Hockey Show, was giving out cards from 1990-91 Series One Hockey. Not promo cards — actual cards that would be found in packs several weeks later. The company was breaking up complete sets, and would give you three or four cards at a time. They didn’t mix them too well either, as I remember being disappointed when I received three of the silver-bordered trophy cards during a visit to their table. Of course, me being me, I kept going back in line for more cards, thinking that I might be able to get all 405 if I was persistent enough. 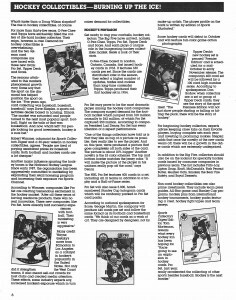 The show program had a full-page article about the new 1990-91 sets. But a lady with Pro Set was onto me, and politely told me to come back every 10 minutes or so for more free cards. I think my sister and I hit that line for free cards every 10 minutes when we weren’t doing other things. I probably ended up with around 100 Pro Set cards. I also remember trading one dealer from Michigan some of my Red Wings Pro Set cards, and another dealer a Wendel Clark card. Overall, everyone was excited about the new Pro Set hockey set. Promo cards for the soon-to-be-released 1990-91 Score Hockey set were given out at the Chicago Hockey Show, too. I ended up with around five of them. 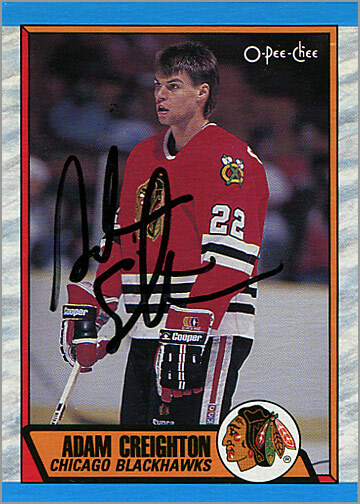 I also vaguely recall a dealer having an uncut set of 1990-91 O-Pee-Chee cards on display, and being excited that Blackhawks enforcer Wayne Van Dorp was included in that set, as well as a card of goaltender Alain Chevrier as a member of the Pittsburgh Penguins. It was cool to see a set, uncut and framed, hanging on a wall. Something like an uncut set of cards just seemed so unattainable when I was a kid. 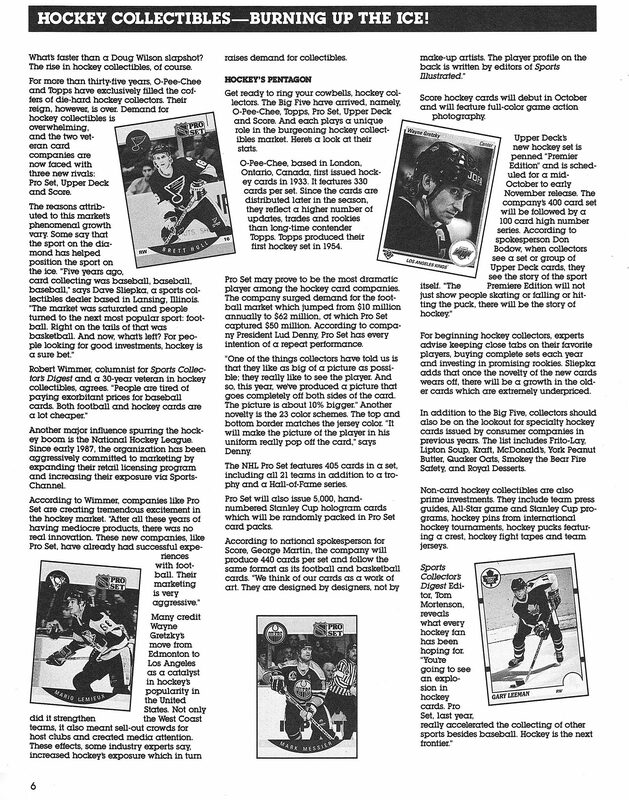 The Chicago Hockey Show program featured a full-page article that hyped the new hockey card sets for 1990-91, advising new collectors to invest “in promising rookies.” Definitely worth reading if you bought cards back then, for nostalgia sake more than long-term investment advice. I was sure to get a bunch of autographs at the show. 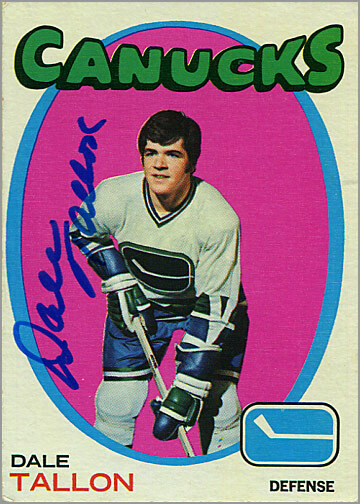 I remember getting hockey cards signed by Steve Larmer, Doug Wilson, Darren Pang and Dale Tallon, who got a kick out of seeing his 1971-72 Topps card (above left). I got Adam Creighton to sign his rookie card (above right). I didn’t have cards of Phil Russell or Cliff Koroll, and Jocelyn Lemieux wouldn’t have any cards for a few more months, so I did not get autographs from those three. I think I got a photo signed by Chris Chelios, and maybe some hockey cards, but this was a little over two months after the Blackhawks acquired him, so I probably wasn’t really a fan of his quite yet. I did get Stan Miktia’s autograph, which was exciting. He wasn’t listed in the Chicago Hockey Show program, but he was there all right. In fact, Pro Set supplied Mikita with a stack of his “Hall of Fame” card from Pro Set Series One. He’d sign a copy of that card for you, along with anything else you brought him. This was before imposing limits became necessary, as most fans — and we were fans, not autograph hounds — would usually get between one to four items signed by each athlete. 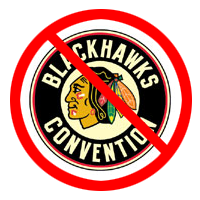 Today, the annual Blackhawks Convention is attended by 10,000 fans each year. But back in 1990, hockey was really more of a niche sport in Chicago, so the Chicago Hockey Show probably had around several hundred fans in attendance. I didn’t have to wait long in autograph lines and I got to meet some of my favorite players. The dealer room was mostly hockey memorabilia, and I scored numerous free hockey cards. It was a fun-filled two-day show. That would have been an awesome show to attend. Most of the shows in my area at that time were just dumpy little rooms with only a few vendors. What area did you live in back then, Paul? I lived in South Western Ontario – just outside of Windsor. I went to the Pro-Set tour show, held at the Navy Pier. Really slow show, since it was held on Valentine’s Day weekend. 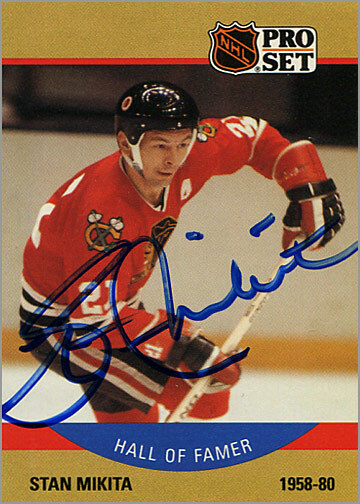 However, got plenty of autographs of those former Blackhawks in attendance (Dennis Hull, Cliff Koroll, Peter Marsh, Dave Tallon and Stan Mikita). 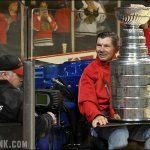 Stan Mikita was awesome! Talked to me like he knew me (first met him at the Detroit stop of the tour months earlier). What a great guy! But then all of the old hockey players were like that to me, except Maurice Richard, who didn’t smile or say anything. Previous Previous post: Aaron Ekblad, Supersized!